There are 27 picture frames on the wall next to our staircase, each chronicling flashes of the life I know. Pictures of my mom and dad on a vacation to Italy while they were dating, pictures of my brother and me in Mexico, pictures of my brother as a toddler in a pumpkin patch. Pictures of my grandpa’s 60th birthday party, of my parents playing golf with their friends, of my late grandfather with my cousins, of my brother and me sitting on a swing set in Korea. My parents immigrated to the United States when they were 8 and 11 years old, and this has been their home ever since. They went to elementary and middle school here, spoke English, and had American friends. Because my parents lived in the United States for so much of their lives, they have in turn impressed upon me values that are not stereotypically “Asian” but “American.” They don’t fit the tiger parent role, which stresses the importance of high academic achievement over all else: I am taught that as long as I try my best, grades are unimportant. Everyone in my house is most fluent in English. My mom cooks risotto, and dahl, and tamales. As they do that, I am growing up in a community that is not reminiscent of Asia but not quite reflective of America either. My high school is 83% Asian, and I am constantly surrounded by people who remind me of their Asian cultures. Classic Asian stereotypes of strict traditional parents and smart students geared towards math and engineering careers permeate so much of this community that I often feel like an outsider, despite having grown up here. When I hear my friends talking to their parents in another language, or complaining that their parents are too traditional, or that they’re tired of eating the same type of food every day, I sometimes feel lucky, but I also feel like I’m missing out on something. I’m not getting the same second generation immigrant experience everyone else seems to be, but I technically am a second generation immigrant. I feel too American, too white-washed, and the people I am surrounded by only make me feel more so. Four years ago, in an attempt to reconnect with my Taiwanese roots, I traveled to Taiwan with a foreign exchange program. But there, I felt even more American. I was fed McDonalds and Starbucks, because that was what my host family assumed I ate, and the Taiwanese students there marveled at my American public school experience: coming home early in the afternoon to minimal amounts of homework. However, these experiences sharply contrasted the one I had during a recent summer spent in Boston, where the lack of other Asian Americans around me made me acutely aware of my race. I was still an outsider, but just in a different way. I’ve been confused for a long time. I feel bad that I can’t say the names of my favorite Korean soup, that I have long forgotten how to speak Mandarin, that I don’t call myself American when the United States is the only home I will ever remember. I feel like I’m doing my ancestors a disservice, the country I grew up in a disservice, and myself a disservice. I was born in the United States; I grew up here. But when I am here, I am constantly reminding myself that I’m not really “from” here: when people ask me what ethnicity I am, I jump to say Korean and Taiwanese. Yet, I am scared that with every new generation that follows mine, we will lose more of what connects us to Korea and Taiwan. We might look Asian, but we will not know of the culture and the language and the life that exists an ocean away. With each generation that passes, we’re losing this part of ourselves that I’m scared we can’t get back. My mom can only speak broken Korean, and whenever my dad returns to Taiwan, it’s on a business trip. The disconnect I’m seeing is because they grew up here, and I know that, but I can’t help feeling unsettled at the distance they have with the countries they left so many years ago. When I recently visited Korea, the country did not feel like home. I felt like a tourist, who couldn’t speak the language, who was learning of the country’s history in its museums, who didn’t know where to go or what to see. There, I realized, I am American. But I also realized that while I didn’t feel home, I was learning so much about where I came from. I met my mom’s cousins, and visited the king’s palace, and ate traditional Korean temple food. Those experiences developed my growing definition of culture, where culture isn’t solely historical, or solely Korean or Taiwanese or American. My culture is uniquely mine; it’s the way of life I’m creating for myself in the present. It’s built from my choices, and my experiences in Taiwan, Korea and California, and it’s a mosaic of everything I’ve learned to love and hate and cherish. It’s a balance, where I feel at home here but don’t feel disconnected from my Asian roots. I haven’t figured it out yet. I still sometimes feel confused and alienated, like I don’t perfectly belong in any one place. But it’s my job now to find out how the life I know and am creating in Cupertino fits into the bigger Asian American narrative and culture. It’s my responsibility to always be reaching for the balance. In some ways, a balance of sorts already exists, in fragments, in the life I was given by my parents. They gift traditional red envelopes to my Korean cousins and me, not on Lunar New Year, but on the 1st of January. Our photographs pay tribute to this hybridity: my aunt’s wedding, everyone dressed in traditional Korean hanboks, hangs next to me sleeping with my stuffed bunny in our apartment in Taiwan. Those pictures hang next to pictures of my brother and I cannonballing into our pool in California, of my parents drinking cocktails in Hawaii, of our family skiing at Lake Tahoe. Hanging on Velcro above the stairs, it’s these pictures that will never let me forget where I’m from. Claire Chang is TaiwaneseAmerican.org’s summer intern. She is a rising senior at Monta Vista High School in Cupertino, CA. She has passions in journalism and writing, which she fosters as an editor of the award-winning high school publication El Estoque. 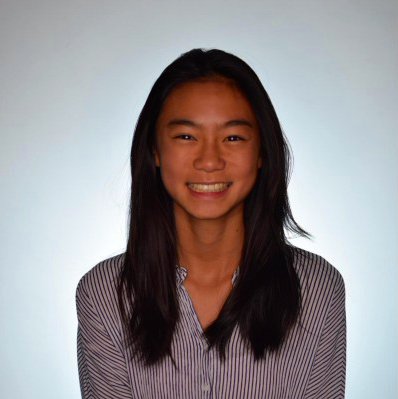 She also has interests in public service and international relations, and is eager to learn more about her own culture through her work with TaiwaneseAmerican.org. 228 and the Power of Storytelling A Rose By Any Other Register for Taiwanese American Youth Summer Camps Who Is Arthur Chu? Villain, Hero, or Anti-Hero?